It was at the memorial to the victims of the Khmer Rouge regime at a wat just outside Battambang that I learnt a lot more about my guide, Mr Philay, and Cambodia under the Khmer Rouge. Philay, like the rest of the population of Phnom Penh, had been marched out of the city when it had been “liberated’’ by the Khmer Rouge and put to work in the countryside. His mother and sister had perished and there had been many times he thought he would, too. He survived by collecting the leftover bones of the soldiers’ meals and recooking them, as well as eating anything he could find, including leeches and leftover rice from the guards’ meals. His Phnom Penh school was later turned into a torture centre, Tuol Sleng, or S21, once the city had been emptied. Almost every Cambodian who was processed at Tuol Sleng and photographed (to prove none had escaped) ended up butchered and dumped at nearby killing fields, mostly at Choeung Ek, on the outskirts of the city. Both Tuol Sleng and Choeung Ek are now Phnom Penh tourist attractions. Philay found his way to Battambang, northwest of Phnom Penh, and was among the tour guides greeting the river boat from Siem Reap on the day I arrived. He was friendly, his English was good and he was happy to drive me around in his tuktuk while I found a hotel with a swimming pool – just what I needed after a six-hour boat trip. The next day, Philay’s smiling face greeted me outside the hotel. He was to take me on a day-long tour of the city and surrounds, on the back of his moto (motorcycle). The thought of being shaken to death in a tuktuk as it traversed the potholed dirt tracks of the region did not bare thinking. It was only hours later, as I was holding on for dear life as the moto bounced along a rough dirt track surrounded by farmland, that I realised how physically draining riding pillion on a motorcycle can be. 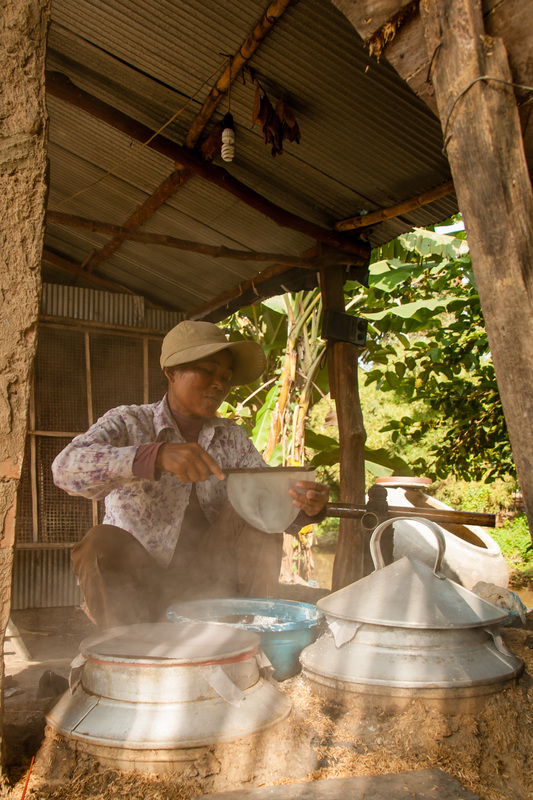 Our first stop was a village called Pheam Ek, a place in which virtually every occupant makes ricepaper for the markets and restaurants of the region. It was photo opportunity No.1 as Philay asked two villagers if I could take photos of them at work. Then it was back on the bike and another five kilometres to Wat Ek Phnom, a temple dating back to the 11th century. I had to give my name to a guard and pay a small fee, which included entry to some of the other attractions we were to stop at. I didn’t quite see how this could work but Philay assured me that I was now paid up and registered for the day and there would be no further problems. Philay was a friendly and jovial chap, always helpful and full of information. So it was even more poignant that he was on hand to guide me around our next stop, Wat Samrong Knong. Nowhere near as old as Ek Phnom, Samrong Knong is now a school and monastery. But during the days of the Khmer Rouge it was a prison, torture centre and killing fields. More than 10,000 people were put to death in the Battambang region while the Khmer Rouge was in power, from 1975 to 1979. At Samrong Knong, there is now a memorial to the victims, including a stupa filled with their skulls and bones, and pictures from the Khmer Rouge days of the murderous cadres and guards overseeing the villagers at work, against their will, in the fields. The Khmer Rouge had considered farm work as an agrarian ideal, but it proved anything but. There was not enough food to feed the masses and the formerly city-based “farmers” and their guards did not know how to get the best from the land. By the time the Khmer Rouge were eventually ousted, some two to three million Cambodians had died, shot or bludgeoned to death, or having succumbed to starvation. “Oh so hungry, hungry all the time,” was Philay’s mantra, as carvings and sculptures at the base of the memorial helped him describe to me the horror of those days. 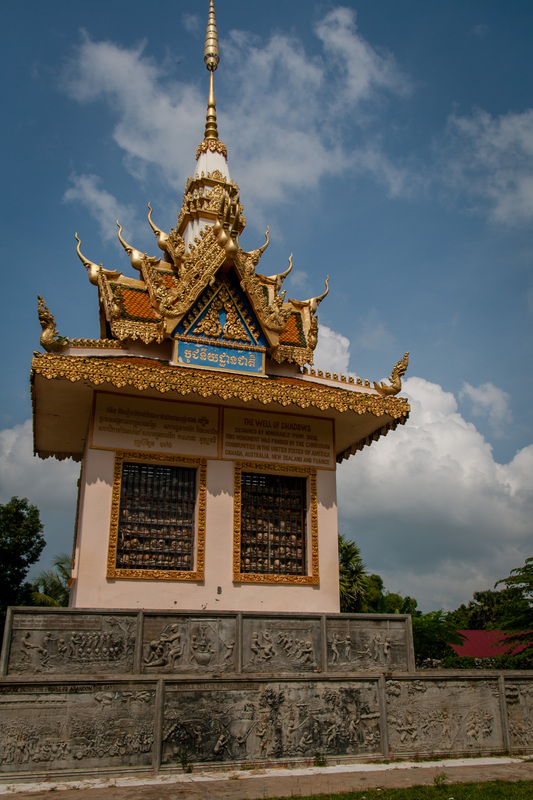 The memorial to victims of the Khmer Rouge regime at Wat Wamrong Knong. Picture: Chris Mannolini. It is difficult to imagine living through such times, and even more difficult to think you could survive and continue on once this chaos and butchery was put to an end, without taking a jaundiced view on the world and its people for the rest of your days. But Philay and many other Cambodians I meet during my stay in the country prove this is possible. Perhaps it is the Buddhist philosophy that has helped produce such a friendly and open people after such a dark period in history. Philay becomes emotional as he recounts his tales, but then it is another smile and a gesture towards the moto and we are stepping around the huge pig that has decided to urinate just a few feet away from us and we are back on the road. Our next stop was the bamboo train, which is apparently a popular tourist attraction; a small wooden platform is powered along a railway track through the bush to, well, I’m not sure where, then returns. I didn’t see the point of this, especially not for $10, so soon we were back on the road and heading through the back tracks, alongside the Sangker river and over a long suspension bridge, past small villages and heading towards our next stop. Phnom Banan is said by locals to be the inspiration for Angkor Wat. Banan was built in the 11th century, and is at the top of a stone staircase of 358 steps. I counted each one, and at the top I quickly surmised that I should have saved the energy and given up at step one or two. 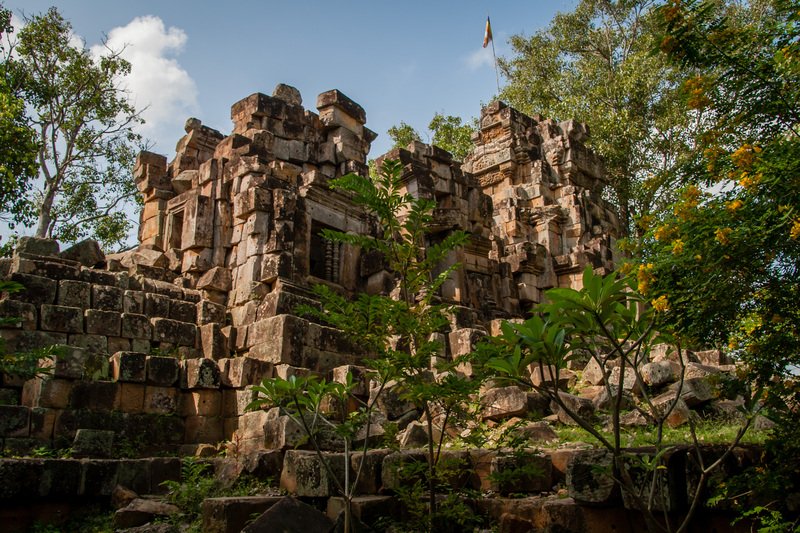 The small temples at the top are in a poor state and the best of the carvings are in the Battambang museum, leaving not much to be attained but a good view of the surrounding countryside and sore thigh and calf muscles. Of far more interest is Phnom Sampeau. Due to confusion as to what Philay was saying, I did not go to the temples at the top of this mountain, but did make the walk up to the Killing Caves of Phnom Sampeau, now a temple and memorial, again, to the many victims of the Khmer Rouge. Guards would bludgeon locals and then throw their bodies through a natural hole to a cave below, which is now the memorial with a stupa full of bones and a large statue of a reclining Buddha. At the base of the mountain there is time for more photographs of the wat and some of the monks, using a beautiful golden light, the near last rays of the sun for the day, before Philay hastens me to one side of the mountain where several tuktuks and a few dozen travellers are waiting expectantly. It is time for the daily ten million bats, as Philay calls it. And as the sun sets, there grows a louder and louder screeching noise from a side cave and then a stream of black pours out of the side of the mountain. 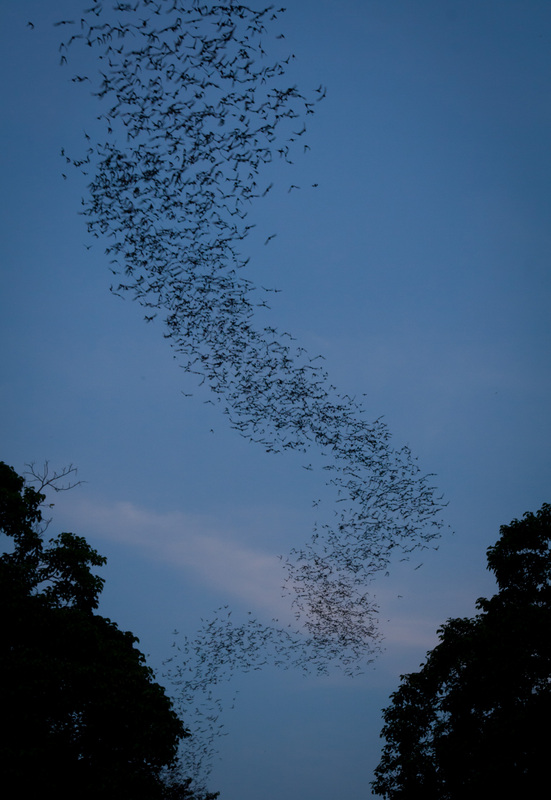 They are bats, swarming out of their cave in search of a feed of insects. And there could well be 10 million of them, as Philay suggests. As they stream out, he says it will be half an hour before the last of the stragglers are out of the cave and following their friends. After several pictures, it is back on the motorcycle and off along a main highway heading home, with the stream of black bats against the darkening sky off to our right and the lights of Battambang ahead of us. Have you been to Cambodia? Have you had similar experiences with the friendly Cambodian people? I would love to hear your thoughts. This post caught my eye, when I was growing up in Lowell, MA I used to shop in a cambodian market “Battambang”. Tons of love for the Cambodian culture. I can’t wait to visit Cambodia fro myself. What an amazing place. Growing up in Mass, USA. I had many Cambodian friends and neighbors. I can’t wait to visit for myself. Great post.